The following code is simple example for creating mobile pages using JQuery mobile. 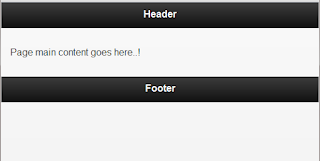 For developing JQuery mobile pages you needs to include the jquerymobile.css, jquerymobile.js and jquery.js files. You can able to download these file from jquery site. This is my single page template. Now preview this page using chrome or safari you can able to get the result like this.